This month, the Michaels Makers and I were tasked with using their fun new Alphabet Soup line to personalize a space in our home. 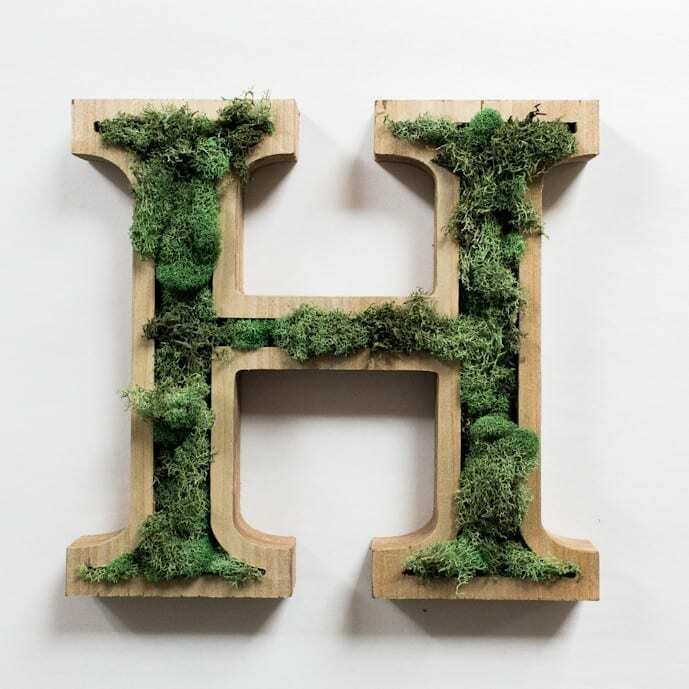 I chose this beautiful, raw wood outline of a letter H and made this moss and wood monogram planter. Since moving into our house a little over a year ago, I feel like we’re finally getting settled, finding solutions to where everything goes. Honestly, I feel like I can’t fully focus on decorating unless I am organized (thanks, 40 bags in 40 days!). 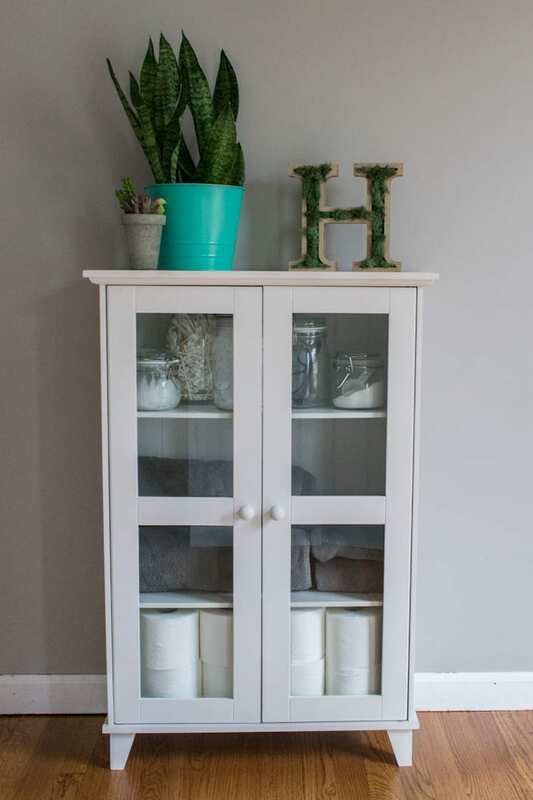 But I often forget how important it is to add those little personal touches to our space! So I’m working on that now and seeing a huge impact in our home. While this looks handcrafted and like it took me a long time, it didn’t. In fact it’s so easy, I can say with 100% certainty that you can make it. Your kid could make it if you drive him to the store. You need two items, both under $10 and usually on sale. 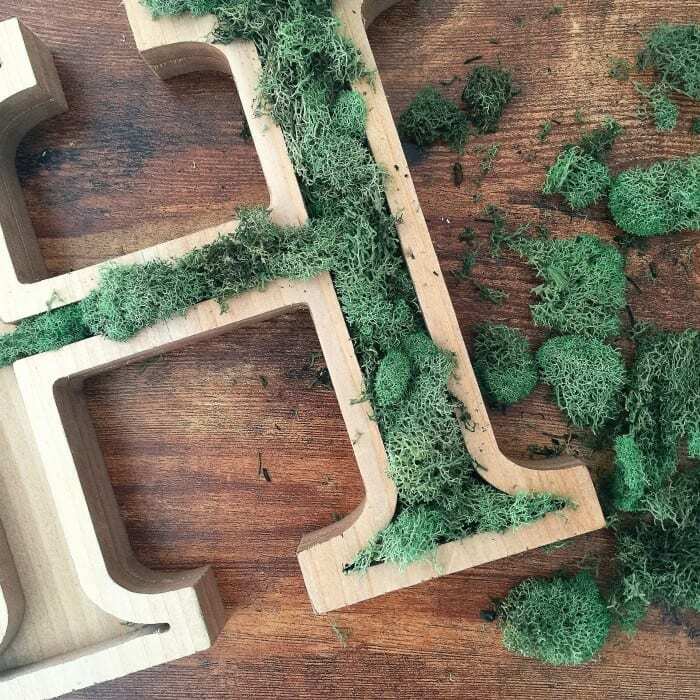 I grabbed my moss and wood monogram. Glued one piece in place, took this picture for the tutorial, and realized how beautifully the moss stayed in there itself and DIDN’T glue any more. 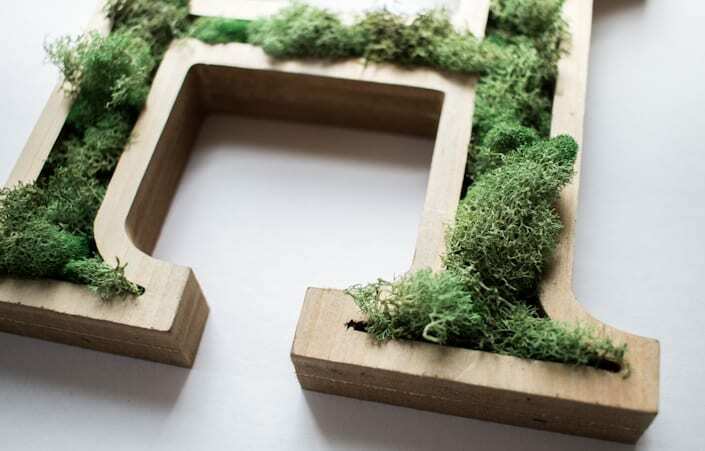 Make sure to stretch the moss to fit little nooks of the letter! Seriously, the raw wood with this spongy, beautiful green moss. I can’t. It’s too pretty. Now that we’re in the cold of winter, I feel drawn to anything green. Are you feeling that way too? 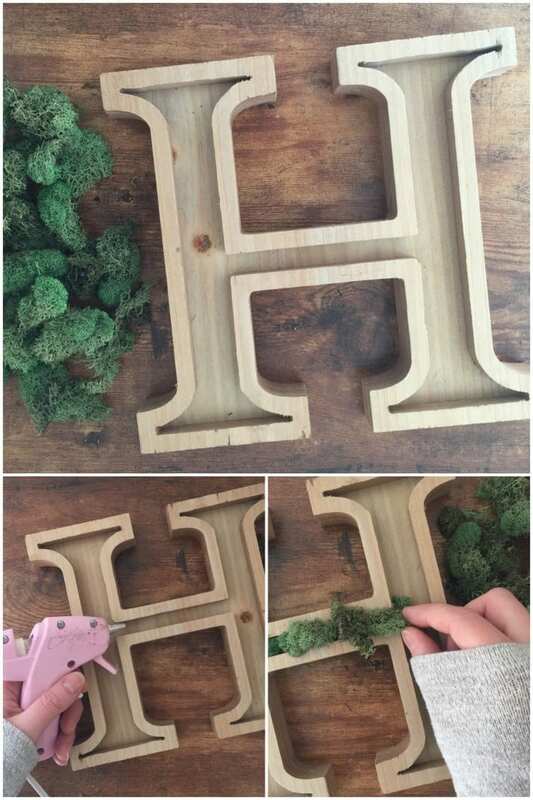 This moss and wood monogram adds the perfect bit of spring to our home. The tin basket is from Michaels too, I spray painted it the same BRIGHT green from in our snowy winter wreath. The little fake succulent planter is perfect for two reasons. One, our bathroom doesn’t get a ton of natural light. Two, even if it did get natural light, I won’t be able to kill it when I forget to water it. You’re welcome, Planty. They will go in our formal dining room turned play room, which is currently under construction. Stay tuned! The best part about crafting is putting your own spin on a project. Whether it’s decorating with marquee lights or crafting an initial that represents your family name, Michaels has made it easy with their new Alphabet Soup by Make Market™ line of products. This collection of surfaces, letters, frames and more come in modern, eclectic or rustic styles. From natural and finished woods, to a variety of metals, resin and patterned styles, the possibilities are endless. 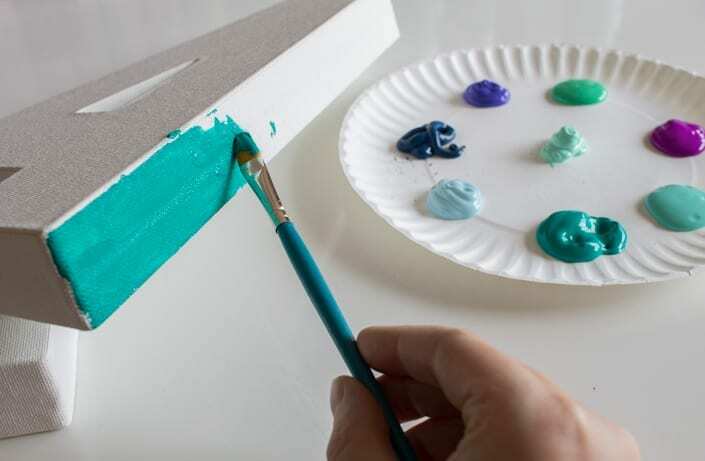 If you need some ideas for personalizing your own letter, take a look at the fun projects on Michaels.com or see the other 49 Makers’ ideas on The Glue String blog. Excuse my use of caps lock, but THEY ARE ADORABLE. Lucite, wood, chalkboard, canvas, pegboard, book shaped letters… I could go on. Go see for yourself. What would you spell, or what materials would use for your letter? Very cute! 🙂 I TOTALLY understand being drawn to springy green things this time of year! I’m also excited to see how your play room turns out! 🙂 I’ve so enjoyed peeking in from time to time to see how you’re settling into your new home. Keep up the great posts! I can’t wait to make the initial with moss! Such a clever idea!! Thank you, DeeAnn! It was a simple project and I’m happy with how it turned out. You could even tuck some silk stems in there too!